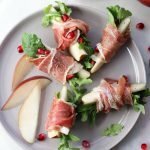 A perfect holiday appetizer or snack with a great savory and sweet combination of flavors. Gluten free, paleo, & whole30. Wash and dry pears, then slice them into 1/2 inch wedges (about 6-8 slices per pear). Cut away any pieces of the core from the slices. Toss the arugula and pomegranate with olive oil. Cut each slice of prosciutto in half and lay them flat. Lay a pear slice and a small bunch of the arugula mixture on top of the prosciutto. Carefully the prosciutto around the arugula and salad, just tight enough so that the salad doesn't easily fall out. Repeat until they're all wrapped and lay on a small serving platter. Wait until just before serving to toss the arugula with oil. You could prepare the salad without any oil, and serve it as-is or drizzle a little oil over the platter just before serving.